It is difficult to fully understand how close an individual bird is to the ideal described in the Standard of Perfection (the written guides which judges use to place poultry at shows) without knowing which faults are common in the breed. The purpose of this article is to supply that information on a number of the most commonly exhibited breeds of ducks. Words in italics and written in red are terms which may not be familiar to the reader and so are explained. The Muscovys, Rouens, Pekins and Aylesburys comprise the group classified by the APA as the large ducks. Newly standardized breeds added to the category in recent years include the Saxony and Appleyard. As they are not commonly seen at many shows at this time, a discussion of their most common flaws will be left for later. This Rouen drake was a prominent show winner for longtime breeder Fremont Conrad of Wisconsin during the 1960s. Overall, I think that the Muscovys have made tremendous strides in the past few years and in fact, are often among the strongest classes in terms of depth of quality. Of the commonly shown varieties of Muscovys, I think that the Blacks are perhaps in the strongest competitive position at the moment. Most competitive Muscovys possess great size and the winners are also in excellent condition. When I see flaws, they are generally centered around the head area. The caruncling (skin which is bare of feathers on the faces of both sexes of Muscovys) on a Muscovy's face should not be unbalanced (more developed on one side of the head than on the other). It should not hamper the bird's ability to see, and the caruncling should be rough in all areas, not smooth. The Blacks in particular have a tendency to show some black pigment on the red face. Also, while the Muscovy has a head which is relatively smaller in proportion to it's body than many Mallard derivatives, should not have a snipy or narrow skull. A Muscovy's legs and feet should be quite large and powerful and the legs should be positioned so that the bird maintains a level carriage. Last but not least, remember that the Muscovy is supposed to be a crested duck. Caruncling which has grown over the top of the head and which has eliminated the crest is a defect. This normally only happens in aged specimens but it can be seen on younger birds when the emphasis on caruncling has been overdone. This winning Black Muscovy drake illustrates the progress made in improving type, size, and caruncling over the last decade or so. While Aylesburys and Rouens are both keeled (a keel is a lose fold of skin which runs underneath the bird from breast to stern) breeds of ducks, there are clear and definite differences between them in terms of type and head points. Rouens, for example, are supposed to have some (but not excessive) arch to their backs while a good Aylesbury should have an almost straight backline. The head of a good Aylesbury should be much longer than that of a Rouen and should be without any crown. The bill should be pink or flesh colored, not yellow. The yellow pigment in the bill is primarily genetic, it is not caused primarily by what is fed. Because they share a common carriage and keel shape, both Rouens and Aylesburys share some common type faults. Many tend to be narrow over the back. Many do not carry an unbroken keel all the way to the stern where it should rise abruptly. This fault is especially common in drakes. Wing carriage is also often too low. Some exhibitors are attempting to disguise this by pulling primaries. 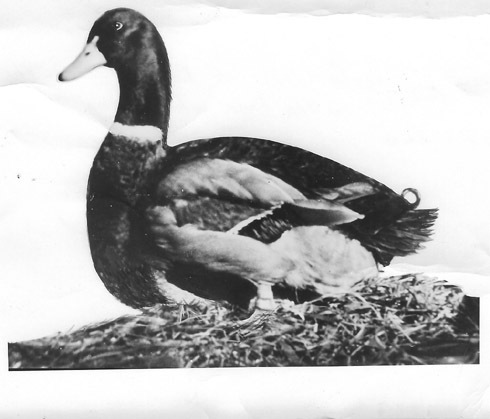 Since uncut and unpinioned primaries are required on any breed of duck which is not a threat to fly, the removal of the primaries should be considered a serious defect in the showroom. Weak wings should be avoided in the breeding pen as well since it tends to be hereditary. Another very common defect is in the shape of the breast which should be bowed in front rather than flat. This fault is also extremely common in Aylesburys. 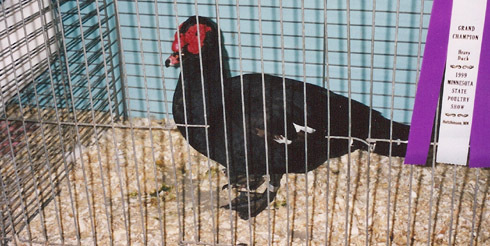 The Pekin has a number of common faults which are quite widespread among exhibition birds. The Pekin should be a massive but clean underlined bird. Many show traces of keel. Many specimens are too near the horizontal in carriage. In head points, most have too long a bill and the head may be too narrow and/or too low crowned. Watch for signs of leg weakness in the Pekin. It is a common problem in such a large and fast growing breed. Now, let's move on to the medium class of ducks, the most popular of which is currently the Cayuga. There are a number of specimens around which disclose no serious flaws and that is why the Cayuga shows up frequently on Champion Row. There are, however, a few faults which are pretty common in even the better classes. In the head area, some birds have heads that are not in proportion to the rest of the bird (too small and refined). Bill color is a frequent flaw with olive creeping well up the preferably black bill on drakes in particular. Perhaps the one flaw (and a major one at that) which often goes unnoticed by exhibitors and judges alike is the presence of stubs (feathers on the legs) of many Cayugas. The presence of such feathers should be a disqualification (the judge will not place the bird- a sign of a serious defect) in a breed which should be clean legged. Cayugas tend to lose some color in the bill, legs, and feet with advancing age. While it is not preferred, the Standard makes allowances for the loss of pigment in Cayugas and Black East Indies one year or more of age as long as it is not excessive. Obviously, however, if two birds are equal in other respects, the bird that retains black feet, legs, and/or bill, should have the edge. Be aware that Cayugas often will possess hidden or obvious white feathers. If the white feather is not conspicuous (I define that as one cannot see the white feather without handling the bird) it should not result in a disqualification but should be considered a defect. As females in particular get older, the white feathers become more numerous to the point that (by age 3-4) where they cannot be shown any longer. Do not discard a good breeder for such "age feathering", however, because the birds are in no way impaired as breeders. In drakes, the age feathers are usually much more subtle, often consisting of a few small white feathers around the eyes. Generally, the birds which are the most richly colored are most likely to have hidden or obvious white feathers. There appears to be a genetic link between the rich, glossy green overlay of color and the presence of white. In the light class of ducks, by far the most popular is the Indian Runner, most commonly referred to as just the" Runner". The Runner possesses a more upright carriage than any other breed of duck. The carriage is one of the most important qualities, which is why Runners should always be judged in a ring where the judge can compare the height (sometimes called "reach") and the carriage (or the way the bird normally stands). Picture a Coke bottle which represents a pretty good approximation of both shape and carriage in the Runner. Common carriage faults include the tail being tucked either between the bird's legs or cocked out (not in line with the body), or the bird not standing straight and tall. The head is an important runner feature, also. There should be no crown on a Runner's head; that is, one should be able to lay a straight edge along the top of the bird's head and ideally, find no gaps all the way to the tip of the bill. Condition is often a problem in classes of Runners. Runners can be tricky to condition for show. While the body should be cylindrical, underweight birds often display a protruding breastbone. Birds which are over fattened usually have more "shoulder" than they should, spoiling the shape of the bird. If Runners are not permitted frequent access to swimming water, they often will lose feathers around their eyes or possess evidence of a low grade infection called 'sticky eye". Judges often are somewhat forgiving of such problems when placing Runners within their class if the overall quality of the bird is very good, but it certainly hurts the Best Runner when competing outside the class for Champion Duck, for example. The top awards in the Runner class are often dominated by the Whites which tend to be superior in type. Other colors which can sometimes compete successfully for Best of Breed include the Fawn and White, the Black, and the Gray (Mallard colored). There are five breeds of ducks that are recognized by the American Bantam Association in the Bantam Duck class. They are Calls, Black East Indies, Mallards, Wood Ducks, and Mandarins. Of the five, the top awards tend to be dominated by the first two: the Calls and the Black East Indies. Classes of Mallards are generally small and classes of Woodies and Mandarins are often lacking altogether. Both Calls and East Indies feature birds which are ideally in the two pound range in terms of size. While overly large birds are still shown, oversize was much more of a problem five years ago than it is now. Today, common problems are more likely to involve improper type and color flaws. The Call and the Mallard constitute two extremes when it comes to body type. The ideal Mallard is long and streamlined. It has a long head and bill, a body which is about twice as long as it is wide and a flat underline. It's wings are powerful and it carries them as if it would explode into flight at any moment. The Call has a very short and deep body. The head should feature a steep rise from the bill and the bill should be short and wide. The East Indie's body type is between those extremes. It's head should be oval, not round like a Call's. The bill should be longer than that of a good Call but much shorter than that of a Mallard. Neither a Call or East Indies should have a concave topline to their bills, as a good Mallard should. An East Indie's body should disclose some depth but the body will not be nearly as deep as a Call's and will be significantly longer than that of a Call. Since the plumage of the East Indie tends to be closely examined by the judge, common flaws often center around color. Purple in the plumage, damaged feathers over the back, olive rather than black bills, legs and feet that have a distinct orange cast rather than being slate or black. As there are a number of colors of Calls, I will only discuss color problems affecting the Grays which are the most established parti colored variety. Females can be too light or dark in background color, can "wash out" in color on the underside, especially at the tail. In drakes, the most common color flaws involve frosting ( white edges to the dark wine colored bib feathers) in the bib and cotton (a white line of feathers) at the juncture between the gray and black sections at the tail. As I have indicated elsewhere, there is no substitute for owning a Standard of Perfection but the above should at least give a novice some idea of what to look for in exhibition ducks.